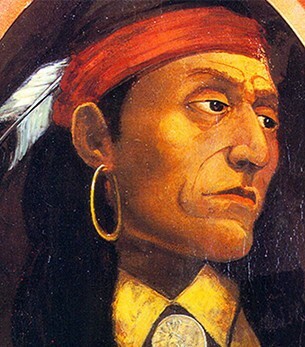 Pontiac (or Ponteac, Ponteach, c.1722-1769) was a Native American warrior and leader, best known for leading an attack on the British in the mid 1760s. Little is known about Pontiac’s early life. He was born in the Great Lakes area in the early 1720s. Pontiac’s tribal ancestry is presumed to be Ottawa, though he may have descended from the Ojibwa, Miami or Potawatomi tribes. By his early 20s Pontiac had become a noted warrior and allied with French settlers against the British. He fought in the French and Indian War and apocryphal stories place him at the Battle of Monongahela, where General Edward Braddock was killed. In 1763 he a loose coalition of Native American tribes in an anti-British campaign known as ‘Pontiac’s War’ or ‘Pontiac’s Rebellion’. Angry at British treatment of natives in the Great Lakes region, Pontiac’s warriors attacked and destroyed eight forts, killed hundreds of soldiers and civilians and drove many British settlers from the area. European understanding paints these attacks as part of a clever strategy devised by Pontiac (‘Pontiac’s Conspiracy’) though this was probably not the case. Pontiac’s War continued until 1764 when British officials began to prefer negotiations with tribal leaders to reprisals. Pontiac’s War failed to drive out the British soldiers – but it did lead to a modification of British policies and better treatment of native tribes. 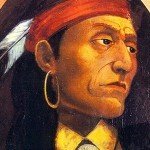 Pontiac himself was killed by another Native American in 1769.